After the row of houses …. James Platts, ramoneur and ventriloquist. The whitewashed house at the beginning of the Wide Yard housed Mr. Platts, the sweep, and his family. The Platts family included father James, boatman but later ramoneur or chimney sweep, his wife and their three children, Myra Ann, Sarah and James junior. In May 1847 James, alias ’Rammonear’, had married Hannah Flinders, daughter of framework knitter John and Dorothy (nee Hemingway) and sister of Thomas of Chapel Street. Over the house in South Street was a painting of the cottage, with the sweep’s brush appearing out of the chimney. I often wonder what became of that picture. The picture over the door of his house was described as a painted representation of Shipley Hall, underneath which were inscribed the words ‘James Platts, Ramoneur’. Having the residence of the local Conservative M.P. pictured above his front door would fit in well with James’s staunch ‘Blue’ political views. In 1855 James senior was fined at Smalley Petty Sessions for leaving three bags of soot for several hours in an Ilkeston street, to the danger and annoyance of passing residents. One Monday morning in February 1864 cries of ‘Fire!! Fire! !’ could be heard in South Street and were directed towards the chimney of James’s house. It seems as though James had neglected to care for his own house!! And the Pioneer rather gleefully reported that he now faced a fine for this offence…. “the Highway Board would be doing good service by giving the ‘Ventriloquist’ a taste of it, and the more so, as he frequently boasts of being in possession of all the Acts of Parliament related thereto”. The Pioneer was never sure how to spell the occupation of James and so experimented with a variety of alternatives. Mr. Platt was a clever ventriloquist, and it gave us great pleasure when we knew he was coming to sweep our chimneys, for he always gave us an exhibition of his skill. It was wonderful to us to hear him holding a conversation with an imaginary boy up the chimney, and he was always ready to give us this pleasure. We did not trouble that we had not seen the boy go up the chimney, We were quite satisfied to hear Mr. Platts and him talking. When James senior died in South Street in August 1869 from a liver complaint, the Ilkeston Telegraph affectionately remembered the sweep, shouting out the friendly call of ‘Old Jim’ around the town as he went about his business…. a man fond of a glass of beer, fond of a friendly chat in the public house corner, having a kind word for everyone and respected by all. “Many a child has cried and run away when it has heard the ventriloquial powers of ‘poor old Jim’ talking up the chimney he was sweeping”. In January 1874 widow Hannah Platts married Kimberley-born bricklayer and widower Nahum Slater. Just two years later however she too was dead. Then a year later, and contrary to the law, Nahum married his step-daughter Myra Ann Platts, almost 30 years his junior but who only survived half a dozen years of married life before she too was dead – in 1883. In 1872 the chimney sweeps of Ilkeston felt obliged to increase their prices by 1d per chimney as a result of rising costs, the first increase in 20 years. At the same time they repeated their advice to customers to have their chimneys swept at least every three months. And into Wide Yard later West Street. The Wide Yard! Yes, we called it the Wide Yard in those days, for it was a yard pure and simple. There were gardens at the back, separated from England’s field – now Albert Street – by a thick hedge. It was a cul-de-sac. The Wide Yard later became West Street. 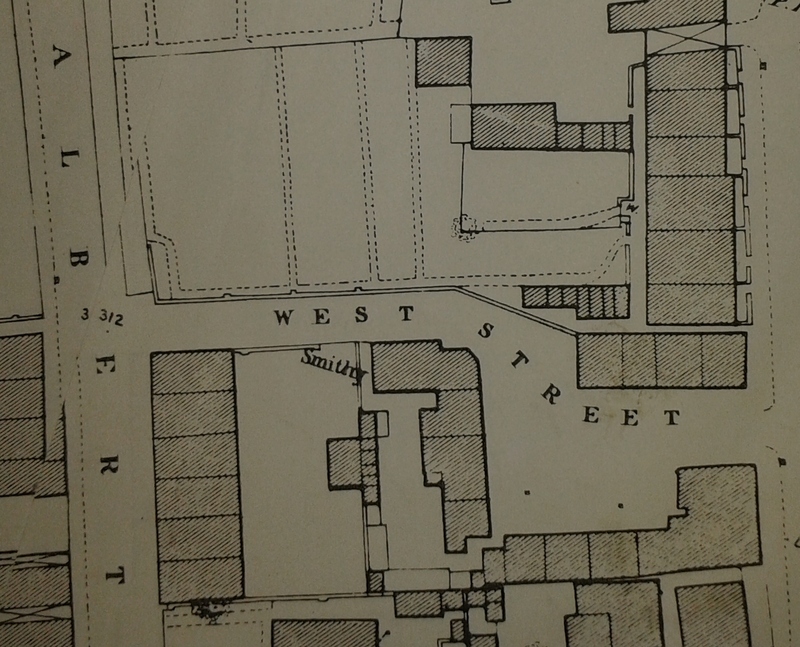 On the 1851 census the Yard is described as part of South Street but by 1861 the name ‘Wide Yard’ is listed. In the 1850’s this area was in the possession of Richard Fritchley, Cossall farmer. Richard died in April 1859 and at the end of that year the trustees of his will put his interests here up for sale by auction. There were also 11 adjacent cottages, at that time occupied by the families of blacksmith William Hodgett, framework knitters and brothers Joseph and Henry Clifford, labourers Thomas Wheatley, Edward Wardle and Enoch Flinders, Sarah Holmes (nee Trueman), widow of labourer George, and others. Also adjoining was the yard and large gardens. The whole property ‘very eligibly situated’ with ‘an excellent frontage of 70 feet to the principal town street of Ilkeston, (that is South Street) covering 700 square yards and producing an annual rental of £63 14s’. The 1861 census names ‘Wide Yard, South Street’, accommodating ten households and listed between the home of James Platts, chimney sweep, and John Scattergood, boot and shoemaker. By 1871 eight of the same ten households were now living in ‘West Street’ which was then between the home of James Platts at 43 South Street and the shop of grocer William Wade at 42 South Street. Wide Yard had ‘disappeared’ — it had become West Street. The houses were kept very tidy, and the tenants were quite respectable. John Meadows was born in Leicester about 1811 and 1844 found him in Ilkeston where he married his first wife, Rebecca Daykin (daughter of West Hallam framework knitter John and Sarah (nee Keeling)?). Their only child Hannah was born in July 1845 before Rebecca died in April 1849, aged 24. At that time John was trading as a dealer in small wares but also working as a boatman. Three months later John married Mary, the illegitimate daughter of Sarah Stenson. The latter had married Thomas Freeman in 1819 and it was the Freeman family name which Mary used at her wedding in 1849. (Mary also had an illegitimate daughter, Sarah Ann, born in October 1839, who continued to live with her mother after her marriage). John and Mary were regular visitors to the stalls at Nottingham Market, where Mary would purchase second-hand clothes to supplement her wardrobe … the Victorian equivalent of recycling via a jumble sale? One Saturday evening, about nine o’clock, Mary was accused by a stallholder, Mrs. Pearson, of stealing a dress … Mary had bought one dress for 1s 2d but then Mary’s husband John was seen walking away with two dresses under his arm !! Both refused to give up either of the dresses and so the police were called. A few days later the Meadows appeared at the Police Court in Nottingham, charged with theft. Now Mary was adamant that she had paid for both dresses, having paid 2s 5d for the pair, and she received generous character references from one stallholder .. she was ‘honest and industrious, a reliable regular customer’. No contradicting evidence could be produced and thus the case was dismissed. The Meadows family spent some time in Baptist Chapel Yard, on the east side of South Street, but by 1861 had crossed the road to take up residence in Wide Yard, where John was now an umbella mender. He died there in March 1876. In the following year Mary remarried, to widower John Mills and moved out of West Street. One tenant who lived there with his family was Enoch Flinders, son of framework knitter John and Dorothy (nee Hemingway) and a worker at Stanton Ironworks. He was the brother of Hannah Platts (nee Flinders). On a Monday evening in December 1863, Enoch was standing at the shop window of chemist Abraham Greaves in the Market Place when he suddenly collapsed, fell forward into the glass, broke the pane and cut his forehead. However the broken glass did not hurt him as he was already dead, from ‘disease of the heart’, having been unwell for some time. Enoch’s family income was 15s, to keep himself, his wife and five children. The Pioneer concluded that…. “his death was doubtless accelerated by want, his scanty wages being quite insufficient to support himself and such a numerous family in health”. His widow Ann (nee Clifford) may have had comfort from her father Joseph, brother Joseph or uncle Henry, all of whom also lived in Wide Yard at that time. Where the road now leads into Albert Street stood Mr. Hodgett’s shoeing shed and blacksmith’s forge. He lived in the house adjoining. William Hodgett was a native of Keyworth, Nottinghamshire, son of Mathias and Sarah (nee Hoe) and married Mary Woodruffe in 1843. Mary was the daughter of agricultural labourer Joseph and Ann (nee Hopwell) and an older sister of John Woodroffe who we meet in Mount Street. The couple moved from the Ratcliffe area to Ilkeston about 1854. In July 1870 miscreants entered the blacksmith’s garden where he had previously grown a crop of rye but was now cultivating five pecks of fine potatoes of a new and scarce variety. The vandals pulled up the whole plot. The Hodgett’s eldest child was son Joseph, also a blacksmith who married Hannah Reeve in December 1863. There were two daughters, Sarah Ann who died of consumption, and Lizzie. There were in fact at least four daughters. Daughter Sarah Ann died on May 15th 1867, aged 19. Elizabeth ‘Lizzie’ Hodgett married engine driver Thomas Richardson in September 1872. Less than six months later Lizzie was a widow when Thomas died on March 14th 1873, living at Hart’s Yard in Cotmanhay, the home of Thomas’s parents, Robert and Ann (nee Hawksworth). Daughter Emma I was born in 1855 and died in 1857. Daughter Emma II was born in 1859. In June 1874, about five o’clock one Tuesday afternoon, she was standing on South Street, at the end of West Street, when she glanced across South Street to the shop of pawnbroker and clothier John Moss. There she spotted navvy Thomas Smith stop at the door of the shop, reach in, grab a sleeve waistcoat and walk off with it. Immediately she went over to tell John what she had just seen. Always one to ‘have-a-go’, John set off in quick pursuit towards the toll-bar and caught the navvy at Robey’s Yard. The pair marched back to the shop and Thomas was placed into police custody at which point he could do nothing but confess – “I’m guilty of taking it, but was the worse for drink”. He was subsequently imprisoned for one calendar month. In 1881 Emma married Ferdinand Walker, boatman of Heage, and moved to live in Derby. There was one other son — William — who was born in 1863 but died in the following year. The mother Mary Hodgett died in May 1864, aged 44 and her widower, William, in July 1879, aged 60 and still living in West Street. And out into South Street once more, we meet Mrs. Scattergood.